The Imo state Governor has made his feelings known to the entire world regarding the recent events in the Niger Delta area of Nigeria saying “ Let the oil wells dry up so that we have rest” He has made what some people could consider a dangerous prayer. Okorocha said he was among some other Nigerians praying that the Nigerian oil wells should dry up so that Nigerians would have a rest. 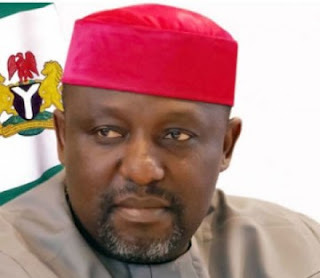 Okorocha made his feeling known at an interactive session with Imo State members of the Nigerian Union of Journalists (NUJ) at the council’s secretariat along Port-Harcourt Road Owerri. According to him, this would drastically reduce problems being encountered by the Federal Government and militant groups particularly the group that called themselves Avengers which has continued to blow up the oil pipelines in the Niger Delta region. The governor also pointed out that this would assist the country greatly in diversification of her economy to other mineral resources mostly solid minerals and the agricultural sectors. According to him, the quick rush of each tier of government going to share the monthly federal allocation at Abuja would be drastically reduced because there would be nothing left again to share. Okorocha restated his commitment to the scholarship scheme he started when he assumed office in 2011. Fielding questions from journalists on the recent expansion of some roads in Owerri metropolis, he said he wanted to develop Owerri so that it would be one of the best cities in Nigeria. According to him, one of the greatest targets he is pursuing right now is how to ensure that Imo Airport has facilities to position it as the International Cargo Airport where aircraft carrying goods would be landing. Governor Okorocha further said that Eke-ukwu Owerre (Owerri Main Market) would be relocated to Egbeada in Owerri North Local Government Area of the state, adding that construction work at New Site was already going on there, rapidly.